If you don’t already know, High Desert Round-up 2017 is this weekend! Being held at Slash X cafe in Barstow. The Hemet Jeep Club will be leading the heavy/moderate Achy Breaky – or rather, our version of it Run Saturday morning. Hi Desert Round-Up or HDR as it is mostly referred to is coming up soon, so now is the time to get all the parts ordered and your planned modifications done. We four-wheelers tend to procrastinate to the very last minute, always thinking I still got time. But we forget that time slips by very fast and we find ourselves out in the garage under our vehicles trying to get the last part installed. This is usually the very last part, the one that just doesn’t want to fit right, while our lovely wives stand there tapping their foot. My wife has a favorite saying, “I thought you said it would only take an hour!” That way you will be prepared and not stuck on a big rock waiting for one of your buddies to pull you off with a strap. So avoid the humiliation of having to be strapped. Make sure your vehicle is in good shape and ready for a day on the trail. HDR is one of the most popular off-highway events in Southern California and has been growing these past few years. HDR was originally an event started by the Waywegos 4 Wheel Drive Club from, I believe, Pasadena. It was called the Presidents Run and was held near Randsburg, CA. I don’t remember how or when it became a C4WDA event. But when talking to some of the old-timers about HDR in the early days, they recollect having a Budweiser Truck on site, wet “T-shirt” contests, and nearly 800 registrations. HDR has been held at Stoddard Valley, Los Coyote’s Indian Reservation, and recently North Johnson Valley and back to Stoddard Valley that I know of. No matter where HDR has been held it has always been a well attended and fun event. 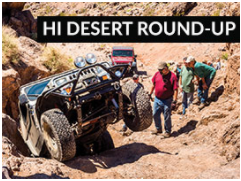 There are eight trail choices listed for Saturday, ranging from mild for the mostly stock vehicles for the participant that just wants to enjoy a nice day in the desert and not have to worry about vehicle damage. Then we have three trails, including a new trail this year that hasn’t been run much. These trails are rated a 4-4.5 with 33”tires (35” recommended) and 1 locker with 2 recommended. No matter which trail you choose it will be a fun filled day. For more information on trails, go to this link. Don’t forget the Sunday vehicle games. The wet lap is always fun, especially when you convince your wife that she is supposed to throw the leftover water in the bowl on the guy at the end. Note: by doing this you won’t make any points, but it’s really funny. The Drifters will be doing the potato race, as they have for the past forty years. There are kids’ versions of most of the adult games, with the stick and can and the potato scoop being the most popular. I now see kids that used to fight tooth and nail for the best score in the stick and can game; some of these kids now have their own Jeep with their kids in the backseat. If you haven’t registered yet don’t worry, you still have time. Cutoff for pre-registration is May 13, 2017. If you miss the cutoff date you can register on-site; the cost is $10 more. So save yourself the added expense and you can buy an extra $10 more in raffle tickets or a couple more chances to win this year’s Win-A-Jeep. HDR base camp will once again be at the Slash X Café located at 28040 Barstow Rd. (hiway247). The Slash X is located about 9.1 miles south of Barstow on Highway247/Barstow Rd. See the map for details.